We entered the 21st Century with the reality of the 20th century, and we continue to face fissiparous and divisive tendencies, uneven development of the various sections of society, utter poverty, and licentious life in every sphere. Indian society is more divided than ever before, in spite of the repeated calls for unity under caste, region, language, or religion. Even though the reality of the 21st Century is rather bewildering, there is still hope for us in India if only we make an assessment of what Bharat has been, what she is today, and what we want her to become tomorrow, and use this understanding to build a better tomorrow. This assessment will help us to bridge the gaps and widen our horizons for a bright future. A key element in such understanding should flow from our immediate past. India can justifiably boast of a great linguistic heritage that we notice in languages such as Sanskrit, Telugu, and Tamil. Great stories are told how the rulers of Indian kingdoms helped develop their languages. It is always easy for us to ignore the immediate past and leap backward to the "glorious days" when our languages had such great power and influence in the lives of men and women in India. The fact of the matter was that, in the recent past, for various reasons, Indian languages lost their ground when India came under the British rule. The reasons for this sorry state were not entirely due to the "calumny" of the British rulers. Our own approach to choice of language style, language use, traditional restrictive practices in imparting education, our uncritical appreciation of everything classical, our failure to widen the horizons of languages, and such other factors contributed to this condition. Fortunately for us, in the immediate past, in the 20th century, there were a few people with great vision who could see beyond their own languages and immediate environments, and devote their lives to bring radical changes in language use. These were also the people who saw the majesty and potential of the speech of the common people, and the so-called tribals. They were men and women well versed in the classical modes and yet had the sensitivity for the best in the ordinary. Two such people were Subramanya Bharati and Gidugu Ramamurti. I propose to outline the contributions of these two great sons of India in developing Indian languages. A holistic approach to progress and development would take into consideration, among other things, the primacy of language and its potential in the multilingual actuality of our nation. Integration to face the threat to our cultural unity and national oneness. Consolidating our own literatures with a view to widening our horizons. The people living in the mountainous terrains, the peasants, the farmhands, and the rural artisans have no access to enjoy the fruits of modern technology. Only the educated and those who have good economic means have access to the fruits of technology. Technology and industrialization, thanks to globalization and liberalization, have been widening the gap between the rich and the poor to dangerous proportions. We need to explore the potential of language as a means of economic growth, political enlightenment, and social equity. In this process of exploration, what our great men and women, and their vision have accomplished earlier would be a pointer to what our strategies for the future should be. In this context we would do well to bear in mind that the 21st Century Reality cannot rest removed from the reality of the past and, more specifically, from the previous century. "Indian Culture," wrote Sri Aurobindo, our compatriot and one of the greatest of global visionaries, "raised the crude animal life of desire, self-interest and satisfied propensity beyond its first intention to a noble self-exceeding and shapeliness by infusing into it the order and high aims of the Dharma." This underscores the actual in that the thought and action of our awakened and enlightened leaders was permeated invariably with spiritualism. Visionaries are beings of a unique order that defies hierarchies. They have a capacity, first, to envision, and, next, to strive and accomplish a mission they conceive in their life. Each is distinctive, not withstanding the fact that they draw from the same fountain of humane, egalitarian, and universally valid faith in humankind's future. A language visionary is one who has both insight and foresight. He can envision the shape of things to come. A visionary in our unifying language Sanskrit, is drashta, one who sees, a sacred one. Hence Carlyle's Latin phrase vates sacer. Though each in a different way, the visionaries did put across the idea that language was a basic tool and device for enrichment of the human condition, for the liberation from fetters, physical and mental. 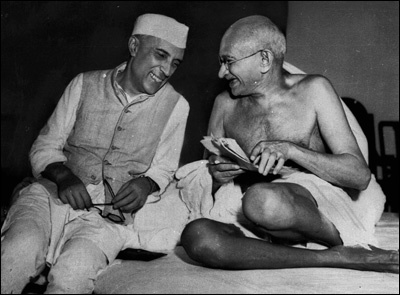 Mahatma Gandhi envisioned a free Bharat and swarajya was his ideal. Along with it went equality and happiness for all. For Jawaharlal Nehru, the vision was not just a free Bharat, but also a fast developing nation making rapid strides towards modernization. Subramanya Bharati envisioned a country liberated, where men and women, the less privileged and the less fortunate, had a way of living happy and contented lives. Gidugu Ramamurty Pantulu thought up a vision of ameliorating the condition of the tribal people, who had no access to education and the meaningful things of life, not even a script for their languages. The necessity of coming down from the 'lofty' elitist ways to the level of people's language that is easily intelligible. The need to recognize the people's language (as opposed to the stilted bookish, literary kind). The urgency to educate, enlighten, inspire, and lead people through a style or language that is more accessible into social egalitarianism and political independence. Gandhiji wrote in 1938, "The medium of instruction should be altered at once and at any cost, the provincial languages being given their rightful place." On another occasion he averred: "To get rid of the infatuation of English is one of the essentials of Swaraj." 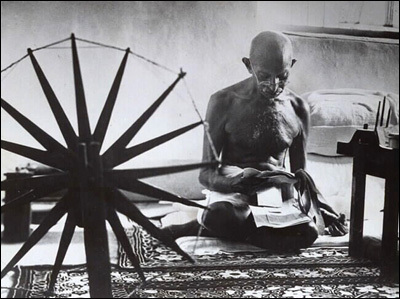 While Gandhiji went on exercising his mind and enlightening people and goading them to think in his way, the other luminaries like Sri Aurobindo in the East, Tilak in the West, and Bharati in the South worked ceaselessly to make people understand the glory of freedom. All these can be best approached through their creative output: Tilak Maharaj though his Gita Rahasya, Sri Aurobindo through Savitri, and Bharati through his innumerable songs penned in the common people's tongue and set to classical and popular folk music. Bharati was acclaimed the poet of Tamil Renaissance uniting in his work the insights of Sanskrit, Tamil, and English. Jawaharlal Nehru went a step ahead. He saw the 'book' as an essential device and tool to leaven and liberate the human mind. He derived this from his vision of India's political emancipation. 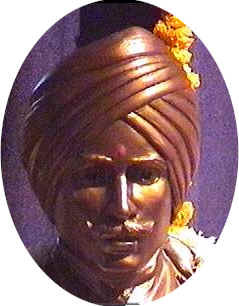 Subramanya Bharati sang, "She (Mother India) has eighteen languages to speak, but the thinking is one." Our goddess of learning Saraswati is Sarva Bhasha Saraswati. For our inclusive visionaries, national independence meant many a thing, not merely political freedom. Without social reform, mere independence would be an empty shell with the kernel missing. Bharati won fabulous popularity and adoration by establishing rapport with the people en masse who revered him as a 'freedom poet'. He poured forth his patriotic idealism with visionary power, exhorting his countrymen to sacrifice all for freedom, for redeeming the weak and the oppressed, taking proper pride in native speech and our hoary heritage. Bharati, the humanist, revolutionary, the savant of music, the secularist in the highest sense of the word, the one who rued the condition of women, died young (he was only 39 years old). That he died young puts him in the order of our venerated intellectuals down the ages, like Adi Sankara and Vivekananda, and some modern intellectual giants, like Srinivasa Ramanujam. These have been torchbearers, inspiring us, leading us into new vistas of human understanding and rationalistic ways of thinking and action. Bharati was a patriot and reformer, for the two functions or characteristics always went hand in hand. His understanding of language was deep: he knew the tremendous power of 'nada', the mother of all sabda, articulate and inarticulate. He combined in himself the progressivism that fought for human equality, and the humanist, thus inviting the wrath of the alien ruler. He inspired people with his poetry written in a language their own, breaking away from the elitist language of the privileged classes and the privileged gender. He touched the most delicate chords in the vast multitudes, the very warp and woof of our nation, through his songs. An inveterate enemy of the alien ruler, his very end was touching. An elephant crushed him and one can easily see the symbolism here, the way the British handled him. It was Pondicherry (then under the French) that gave him 'refuge'. No wonder he came to be hailed as 'a poet of patriotism and a prophet of nationalism'. He gave the people's language the importance it deserved and for that he goes down in the history of the Tamil language as a visionary. Lovingly admired and referred to as pidugu (a thunderbolt) rhyming with his surname, Gidugu, Rao Saheb Venkata Ramamoorty was a language visionary in Andhra, the land where more than seventy million people speak Telugu today. The primacy of oracy in communication and the changeability of language leading to evolutionary development are part of the understanding of the nature of language, consequent on the development of linguistics as a science. Linguistics has become extremely relevant to teaching languages 'native', inland and foreign. A record of the contribution of Gidugu in the areas of language teaching, applied linguistics, philology, and social service are available now. He was the leader of a successful movement for making vyavaharika bhasha ("current" or "active" or "everyday" language of transactions) the medium of teaching Telugu and the language of examinations for awarding degrees. The language of the sasanas (inscriptions), the language loaded with Sanskrit diction of the kavyas, and the language spoken every day, were not the same. For many of the Telugu speakers themselves, kavya bhasha is mostly incomprehensible. The grandhika bhasha ("written language") then taught in schools and colleges did not promote the skills necessary either for understanding or communicating effectively in real life situations. The development of people depends on their language skills. When scholarship is limited to the creamy layers of society because of the difficulty in learning language, the rest of the society is denied access and opportunity for development. Gidugu was an eminent language visionary. The achievements of Gidugu are many. As a pedagogue he was decades ahead of his time. He recognized the primacy of oracy and the efficacy of the by now accepted 'direct method' of language teaching. He believed in equality: loved the Savara people, a (Munda) tribe living in the borders of Andhra and Orissa. He gave their language a script, prepared lexicons, and taught them, sometimes, at his own expense. As long back as in 1910, he started working on Savara language, which had no writing system. For teaching Telugu, he wanted the spoken language to be the medium of instruction. This engulfed him in a war with the orthodox Sanskrit-educated pundits, which sometimes turned vitriolic. Thanks to Gidugu's tenacity and commitment, sishta vyavaharika (standard, current, and spoken language) gained currency and acceptance. A lot needs to be said to present even an outline of his achievement. The British Government conferred on him the title of Rao Saheb not for loyalty to the Crown but for his service to the Savaras, to pedagogy and to Telugu. Dr. Radhakrishnan was all praise for his Savara lexicons. European linguisticians like Jules Bloch and Daniel Jones recognized his work on Munda linguistics as pioneering and original. Gidugu translated Otto Jesperson's A Short English Grammar. He addressed the teachers when an opportunity came in 1910 to adopt the direct method to teach English and vyavaharika bhasha to teach Telugu. He came out victorious in the battle against the grandhikavadis who wrongly equated vyavaharika with gramya. Gramya, in practical parlance, is "uneducated," and sometimes, "vulgar" too. To drive home his pedagogic, literary, humanistic, and modernizing thoughts, Gidugu boldly, untiringly and persuasively used the press, publications, the public platform, social discourse, and even pamphleteering, never once losing his cool and objectivity in argument. Between 1910 and 1914 he went about talking, arguing, convincing, making rapid strides even in the face of stiff opposition. Balakavisaranyam, Gadya Chintamani, Andhra Pandita Bhishakkula Bhasha Bheshajam and Vyasavali are his efforts to convince and plead with his opponents to see reason. Ramamoortygaru saw in his own lifetime people seeing his point and rallying round him. Veeresalingam Pantulu founded Vartamana Vyavaaharikandhra Bhasha Parivartaka Samajam and as its president endorsed Gidugu's views. Andhra Sahitya Parshat, Kakinada, withdrew from the fight in 1924. In 1933, Abhinavandhra Kavi Panditasabha, under the chairmanship of Chilukuri Narayana Rao Pantulu, resolved that modern vyavaharika must be the medium of instruction. In 1936 a journal was started publishing articles in the current cultivated Telugu. In 1937, Tapi Dharma Rao started a periodical in this style. The government and the universities had to listen to reason. Today, the cultivated current Telugu (J. a. Yates's phrase) is the medium of instruction, of examination, and even thesis writing. Newspapers use this language generally and so does the electronic media. Gidugu's work speaks for itself. A number of scholars, linguisticians, and teachers have discussed Gidugu's work and wrote voluminously about his achievement. Most important among them are Telugu Bhasha Charitra edited by Professor Bh. Krishna Murty, Vyavaharika Bhasha Vikasam by Dr. Boodaraju Radhakrishna, and Maroo Sari Gidugu Ramamoorty edited by Professor C. Rama Rao. Late Burra Seshagiri Rao of Bharathi Thirtha fame, David Stampe and J. A. Yates are among many others who recorded their admiration for Gidugu's work. Stanley Strarosta, well-known linguist and professor at the University of Hawaii, dedicated his Ph.D. thesis submitted to the University of Wisconsin to this luminary. Gidugu was awarded the title Mahamahopaadhyaya. He goes down in history as a visionary. And Vyvaharika bhasha came to stay. These two visionaries from the South had identical views about language use -- simplification, and effective communication through the use of popular language. While Subramanya Bharati did not have time to get involved in language development beyond his own language because of his total immersion and active participation in the freedom struggle, Gidugu went beyond his language to help a lesser known preliterate language, and to help the socially deprived and economically disadvantaged people group speaking this language through actual language development steps initiated by him. Political independence and simplification of language was the focus of Subranya Bharati's vision. Gidugu's vision, on the other hand, was social development through the simplication of language use. Subramanya Bharati was a creative writer of poetry and prose, and Ramamoorty was a creative writer of grammar and effective prose. Both were consumed by their passion and love for Indian languages. Their vision of India was that every Indian language, inculding the socially disadvantaged tribal languages, has a rightful place in the Indian mosaic. They envisioned an India where science and all disciplines of knowledge will be actively pursed using the medium of living Indian languages, even as they would enjoy the beauty of our classical languages and styles. Herein lies the model of reality that we need to pursue in the 21st Century. A paper presented at the National Seminar on the 21st Century Reality at Mahatma Gandhi International Hindi University, New Delhi, 29-31 October 2002. V. V. B.Rama Rao, Ph.D.